SPOILER ALERT!!! This episode contains MASSIVE SPOILERS for Solo: A Star Wars Story. If you have not seen the film and don't want to be spoiled, wait until you've seen the film to listen! 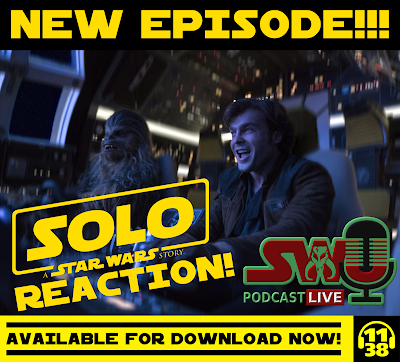 On this episode, Dominic, Ben, and Chris are joined by Shawn Geroux and Johnny Vorstenbosch from the Star Wars Wastelands podcast, musician Din from the band F-105, an filmmaker Tye Nelson (The Distant Echo: A Star Wars Fan Film) to share their immediate thoughts on Solo: A Star Wars Story! They share their thoughts on the portrayals of characters new and old, as well as on how the world of this film compares to previous ones. And yes, they do talk about THAT thing (you know the one), how it fits in with current Star Wars, and what it means going forward. All this and much more! Solo Box Office Boom or Bust?